When I saw this sweet old dog with the sad eyes today on Petfinder, I just knew we had to help him. I called to get more information and we are sending a donation to sponsor him for his ongoing care. I hope to have updated photos soon. Thanks to this small organization for caring about an old dog that was definitely down on his luck. Soldier lived outside with a man that could not keep him. The Rural Iowa Animal Rescue took Soldier in and he is now living in a volunteer home. Soldier has always been an outside dog and is currently living outside in a heated barn. 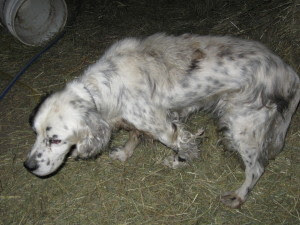 He is a 15 year old English Setter that could use a haircut! Soldier only has a few teeth left and is mostly deaf. 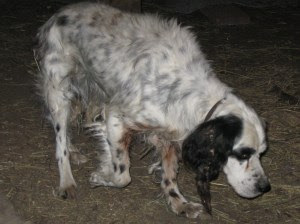 He was used for breeding, and due to his age it is not safe to neuter him now. Soldier is very sweet and does excellent with other cats, dogs, and kids. Soldier will need a home that can keep him in a heated shed or barn and will be able to provide him the proper care for a dog his age. Soldier is in need of sponsers to help pay for his grooming bill as well as for his special senior dog food. He is also on joint supplements. Soldier's adoption fee is $55. Please email for more information or an application! This pet is up to date with routine shots.